The purpose of photosynthesis is to harness light energy and use it to move electrons through an electron transport chain. Electron carriers are arranged, in order of increasing electropositivity within a membrane. Through this process, a proton motive force is created that is used to produce ATP. Electronegative compounds are better at donating electrons than electropositive ones are. As electropositivity increases, a compound becomes better at accepting electrons. The compounds used to carry electrons include pheophytin (chlorophyll without the magnesium ion (Mg2+) center), quinones, cytochromes, plastocyanins (copper-containing proteins), nonheme iron sulfur proteins, ferredoxin, and flavoproteins. There are two main types of photosynthesis: oxygenic (the kind that generates O2) and anoxygenic (the kind that doesn’t generate O2). Anoxygenic photosynthesis is used mainly by the purple bacteria, the green sulfur and nonsulfur bacteria, the heliobacteria and the acidobacteria. Oxygenic photosynthesis is used by the cyanobacteria, the algae, and by plants. Oxygenic photosynthesis occurs in, among others, eukaryotic microorganisms like algae and in bacteria such as cyanobacteria; the same mechanism is at work in both. Electron flow happens through two different electron transport chains that are connected; together, these electron transport chains are called the Z scheme. The stars of each chain are photosystem I (PSI) and photosystem II (PSII), each containing chlorophyll reaction centers surrounded by antenna pigments. Don’t let the names fool you, the flow of energy is from PSII to PSI. The chlorophyll in PSI is called P700, and the chlorophyll in PSII is called P680, for the wavelengths of light each absorbs most efficiently. The steps involved are summarized here. 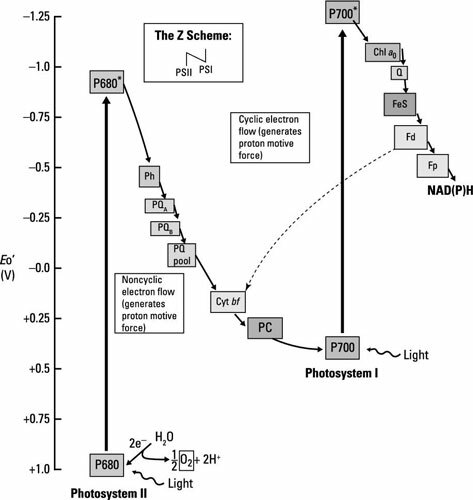 Light energy (a photon of light) is absorbed by PSII, exciting P680 and making it into a good electron donor that reduces the first member of the electron transport chain, pheophytin. PSII is normally very electropositive and it would just remain reduced unless excited by light. Water is split to generate electrons used to reduce P680 back to its resting state. The protons (H+) from water act to create the proton motive force, whereas the oxygen is released (giving the pathway its name). The electrons travel through several electron carriers until eventually reducing P700 in PSI. P700 is already oxidized after having absorbed light and donated an electron to the next electron transport chain. After passing through a series of electron carriers, the last step in the process is the reduction of NADP+ to NADPH. Aside from the production of NADPH, electron transport functions to create the proton motive force, which is used by ATP synthase to generate ATP. Because electrons don’t cycle back to reduce the original electron donor, this pathway is called noncyclic photophosphorylation. If things are ideal and enough reducing power (extra electrons) is available, some of the electrons do travel back to reduce P700 and in the process add to the proton motive force that generates ATP (or phosphorylation). When this happens, it’s called cyclic photophosphorylation. The cool thing about microbes is how resistant they are to extenuating conditions. For example, when PSII is blocked, some oxygenic phototrophs can use cyclic photophosphorylation with PSI alone in a similar way to how anoxygenic phototrophs do it. Instead of oxidizing water, they use either H2S or H2 as the electron donor to provide the reducing power (the electrons) for CO2 fixation. Many of the steps in anoxygenic photosynthesis are the same as those for oxygenic photosynthesis (see the preceding section). For example, light excites the photosynthetic pigments, causing them to donate electrons to the electron transport chain and ATP is again generated from the proton motive force created by electron transport. Oxygen is not released because P680 of PSII is not present. 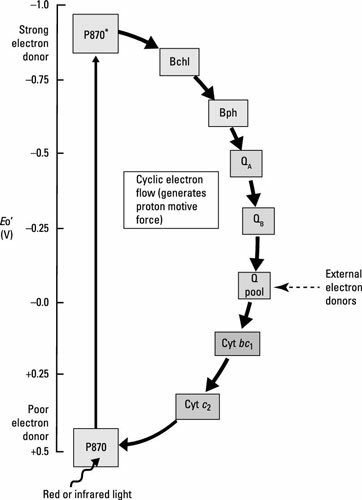 Water is too electropositive to act as the electron donor for the photosystem. Depending on the species, the reaction center can consist of chlorophyll, bacteriochlorophyll, or other similar pigments. The reaction center in purple bacteria is called P870. Some of the carriers within the electron chain are different, including bacteriopheophytin, which is bacteriochlorophyll without its Mg2+ ion. Electrons cycle back to reduce P870, so this is a cyclic electron transport chain leading to generation of ATP through cyclic photophosphorylation. Unlike in oxygenic photosynthesis, where NADPH is the terminal electron acceptor, no NADPH is made because electrons are cycling back into the system. Without NADPH, cells have to come up with another way of generating the reducing power necessary to drive the Calvin cycle for carbon fixation. This is accomplished through oxidization of things like inorganic compounds. The electrons donated are added to either the quinone pool (purple bacteria) or donated to iron-sulfur proteins (the green sulfur and nonsulfur bacteria, and the heliobacteria). When the electron acceptor is not sufficiently electronegative (as in the case of quinone), then reverse electron flow is needed to get the necessary reducing power. Reverse electron flow uses the proton motive force to push electrons to reduce NADP+. This mechanism is used frequently in other situations, where several turns of the electron transport cycle are necessary to generate enough power to reduce one molecule of NAD+ or NADP+. In some phototrophs, both ATP and reducing power (that is electron donors like NADH or NADPH) are produced from the light reactions, whereas in others (like the purple bacteria) the light reaction producing ATP but reducing power has to be obtained in separate reactions (like oxidizing inorganic compounds).